UPDATE: Queen Maxima of The Netherlands wound up her three-day visit to Pakistan after a meeting with President Mamnoon Hussain where she praised the $46 billion China-Pakistan Economic Corridor project, saying it would bring in prosperity to whole South Asian region. The UN Secretary General’s Special Advocate for Inclusive Finance also praised Pakistan’s efforts for promoting more financial inclusion saying it was one of only 25 countries focusing on this issue. 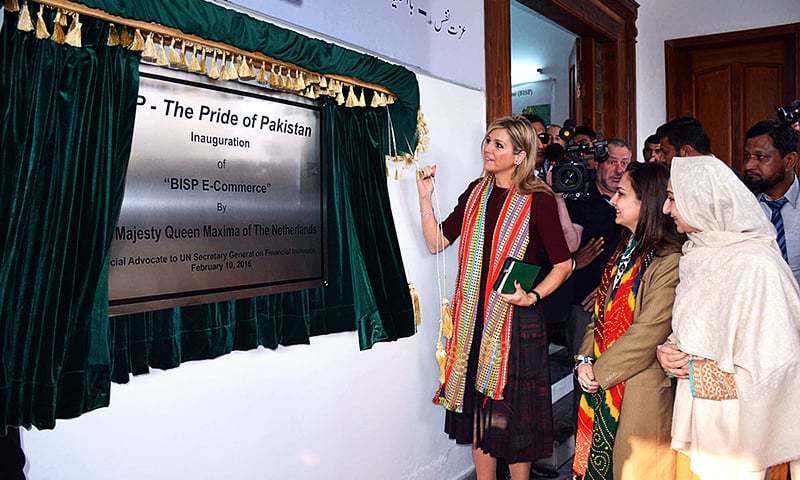 Queen Maxima of Netherlands had a busy day on Wednesday in Islamabad and Rawalpindi as she visited private and public sector institutions giving out financial help and services for the poor people of Pakistan. She paid a visit to the Benazir Income Support Programme (BISP) office in Rawalpindi and was highly impressed by the financial aid programme. The Queen stated that Pakistan was very well-positioned as it included all Pakistanis in the overall economic process. 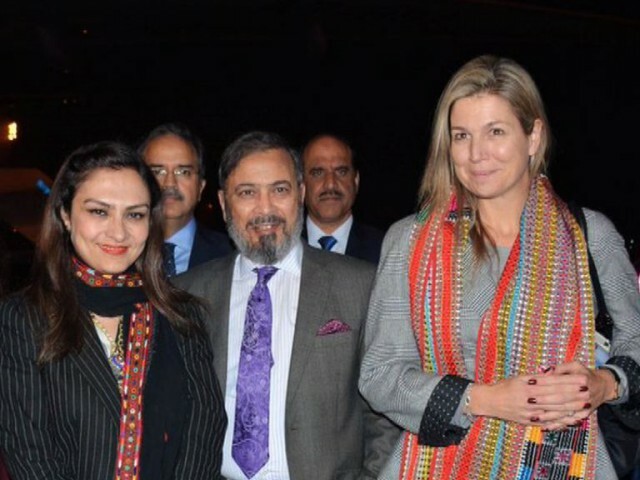 She visited Pakistan as UN Secretary General’s Special Advocate for Inclusive Finance for Development. The Chairperson of BISP, Marvi Memon had briefed the guests and stated that the number of people who have benefitted from the BISP crossed 5.2 million. Queen Maxima of Netherlands has arrived in Pakistan on a three-day scheduled visit today, Tuesday. The visit has come in support of the Pakistan National Financial Inclusion Strategy. According to Radio Pakistan, the queen during her visit will be holding meetings and discussions with the Prime Minister Nawaz Sharif and the Finance Minister Ishaq Dar. The meeting will also include Governor State Bank of Pakistan. The Queen is visiting Islamabad as UN Secretary General’s Special Advocate (UNSGSA) for Inclusive Finance for Development. “Queen Maxima encourages universal access for individuals and enterprises, at a reasonable cost, to a wide range of financial services, provided by diverse responsible and sustainable institutions,” Pakistan’s Foreign Office said in a statement. The Prime Minister also met the Queen in the World Economic Forum in Davos in January 2016. Moreover, the queen will lead discussions on improving access to financial services such as savings, payments, credit and insurance. The queen will lead these discussions with the representatives of international organizations, financial organizations, telecom companies and micro-finance institutions. The strategy of holding exploratory discussions and meetings over-inclusive finance for development strategy was launched in May 2015. The main purpose of promoting this strategy is to make the financial tools accessible to the poor people in order to protect them against difficulties and improve the quality of their lives. In the upcoming years, the government aims to operate a program through which they can ease the implementation of Pakistan’s financial strategy. This plan is expected to be completed within a five-year duration of time. Previous articlePIA Sacks 20 Daily-Wage Workers,150+ Notices Served!